The elaborate detail of the Leon Broad Buckle Belt signifies wealth and status. 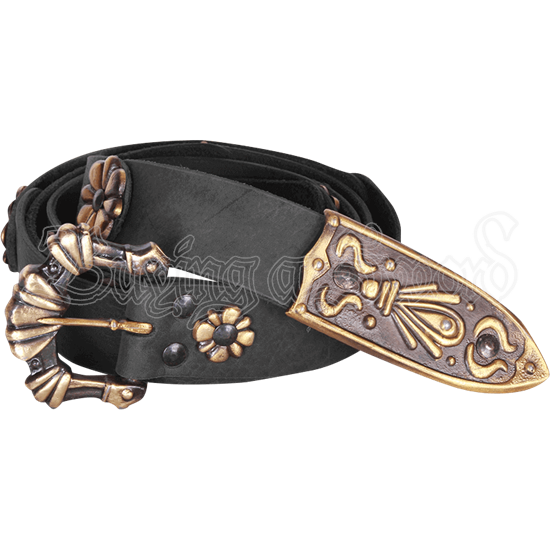 Whether you are a knight, mercenary, traveling merchant, or noble, this fine accessory offers versatility and style for LARP and historical reenactment. Medieval floral patterns decorate the buckle and tip of the belt. Flower accents line the leather strap throughout. Handmade from upper leather, the strap is soft and smooth to the touch, yet extremely durable. The belt is long enough to fall loosely from the buckle area, and the lack of pre-punched holes offers even more customization in appearance.